I’ve passed by the Me Va Me on Bathurst and Steeles many times and was always a little curious about this restaurant. One evening I noticed that a new location had opened up so Mike and I dropped by to give it a try. We arrived around 8 on a Saturday and as I expected, it was pretty busy. The hostess quoted a twenty-five minute wait time which I was fine with. Most restaurants are packed on a Saturday evening, so we decided to stick it out. However, what really frustrated me was that I could see tons of people leaving the restaurant, yet nobody was being seated, despite the large line spilling out the door. I saw many free tables with dirty dishes still on them and could tell the tables were being cleared incredibly slowly. 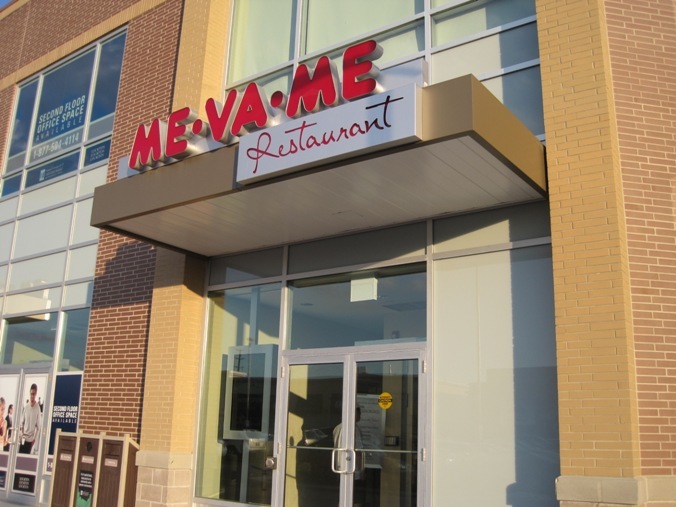 Maybe we should have gone to Me Va Me Express next door instead to get take-out. Finally, forty minutes later, we were seated. It’s a casual dining restaurant popular with many families with young children and grandparents. I can see why – the menu is enormous so there’s definitely something to suit everyone’s tastes. While waiting to be seated, we had a clear view of the partially open kitchen where we could see some of the food being grilled and prepared. We saw a lot of salads and dip going out of the kitchen so we decided to start with the Trio Salad Plate ($8.99), which comes with your choice of three salads or dips. We chose the hummus, baba ganush and beet salad from a selection of about 10 different varieties. 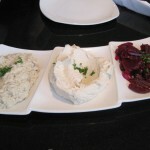 The hummus – a creamy puree of chickpeas and Tahini sauce seasoned with lemon juice and garlic, wasn’t anything special. Pretty much a standard hummus, if you ask me. 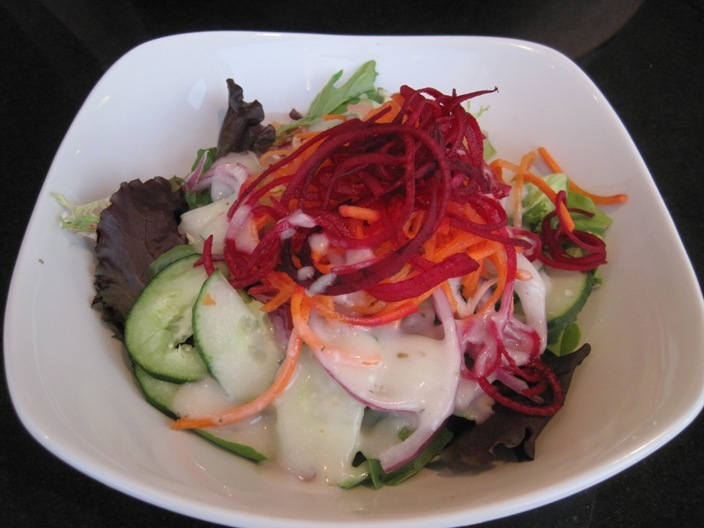 Similarly, the beet salad – diced cooked beets mixed with onions and an olive oil vinaigrette dressing wasn’t very memorable. This was unfortunate since I love beets, but I never cook them at home because they’re such a hassle to deal with… they stain everything! The baba ganush – grilled eggplant on an open flame, pureed and mixed with mayonnaise and seasoned with lemon juice and garlic, was easily our favourite of the trio. You could really taste the eggplant in this dish and it was seasoned perfectly. I’m not sure how authentic the addition of the mayo was, but it certainly tasted great. 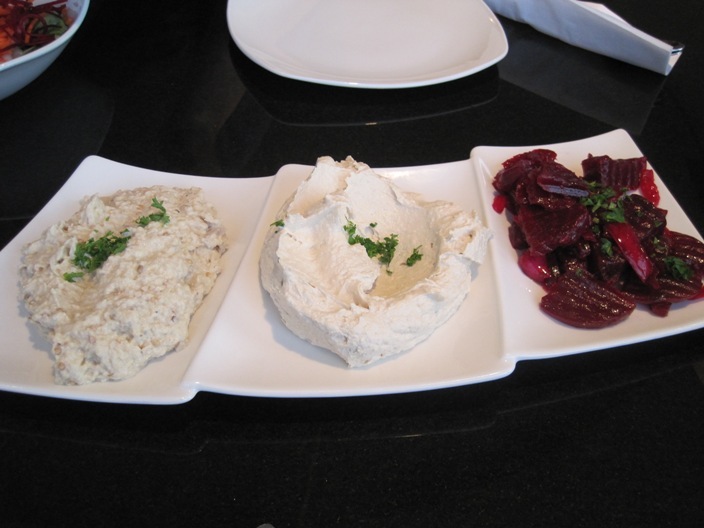 We scraped every bit of this dip off the plate with the warm pitas it was served with. Delish! 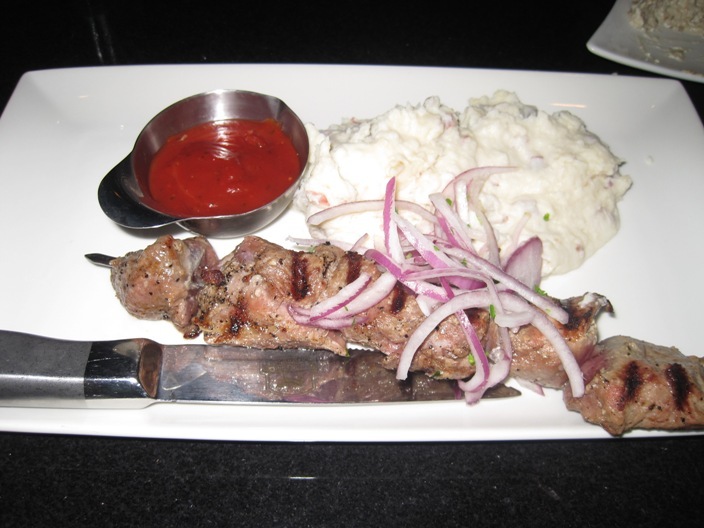 For my main, I decided to go with the Lamb Skewer ($13.99), since the skewers seemed like a popular choice amongst the other customers. 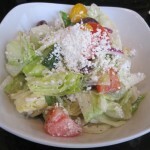 It comes with a salad but I decided to upgrade mine to a Greek salad for an extra $0.99. 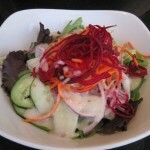 When the salad arrived, I was surprised by how large it was. I was starting to see why this place is popular with families. 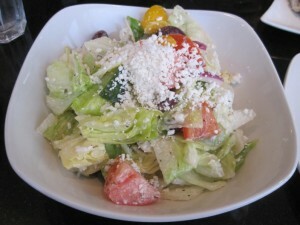 The ingredients in the salad were fresh and there was a generous portion of feta, olives and tomatoes. Worth the extra buck! 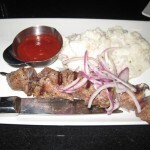 As for the lamb skewer, I found it to be on the chewy side as it wasn’t the greatest quality of meat. Chewiness aside, it was seasoned well and cooked how I asked (rare). You also get a choice of a baked potato, mashed potatoes, fries, rice or vegetables for your side. I went with the mashed potatoes which I wasn’t anything special. Now, what I found odd about the dish was that it came with a side of what tasted like ketchup. It brought me back to my childhood where I used to eat everything with ketchup…including steak. Mike went with the Chicken Shawarma Dinner – thinly sliced chicken with special seasoning with tahini ($14.99). Similar to my meal, it came with a salad and a choice of a side. He decided to have his shawarma with rice. 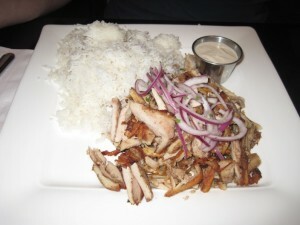 The portion was pretty substantial as it came with a large mound of meat. 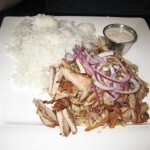 I had pretty high expectations for Me Va Me’s shawarma, so I was really let down when I had a taste of this. It was just way too dry, as if all the meat had been pre-cut hours ago. It was also a bit bland for my liking. Even the tahini sauce couldn’t save the meat. What a disappointment. Overall, I found the food to be pretty unmemorable. Sure, we both loved the baba ganush, but nothing else really stood out. The service wasn’t anything to write home about either, so you won’t see me coming back here any time soon.